Email Template Builder Outlook for Internal Comms! The only email template builder designed for internal communicators using Outlook! "Game Changer for Internal Communications! ContactMonkey has gorgeous, built-in HTML templates and its insight into email activity is amazing. " Preview your email designs on both desktop and mobile to make sure your messages are responsive and look just the way you intended, even in Outlook. Choose from dozens of pre-designed internal email templates or upload your existing responsive HTML email designs straight to Outlook to get started. 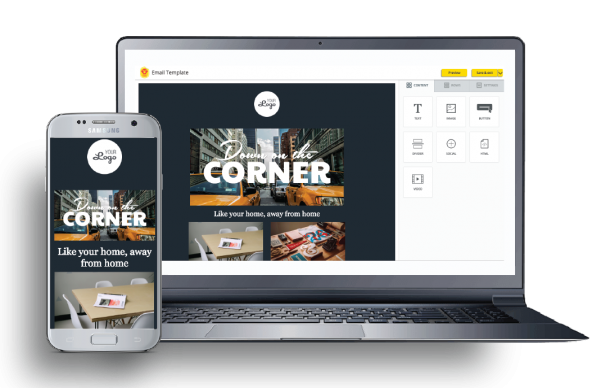 Use our simple drag-and-drop email template builder to customize your email template design to match your companies brand colours, messaging and imagery style. Send & track your beautifully designed HTML employee newsletter to your existing Outlook distribution lists from your Outlook inbox. Install right into your Outlook or Gmail inbox. Available for Outlook for Windows, Outlook for Mac, Office 365 and Gmail. Create, send and track all your employee emails within your inbox. Personalize email subject lines and body copy in one click to each employee on your distribution list, dynamic distribution group or upload a CSV file. Measure at an individual employee or aggregate campaign level to identify what works, what doesn't, and continually improve your employee communications. Send your beautiful branded newsletters to your existing Outlook distribution lists. Never worry about maintaining or exporting your employee email lists to an external system ever again. Ready to start sending beautiful responsive HTML employee emails?